UPDATE: 12-28-2011 - SUSPECT VEHICLE HAS BEEN LOCATED BY UNDERWATER CAMERA IN THE CANAL. Update: 01-26-11 1330 hrs- One more car has been pulled, 2 more objects have been located further South. Search Operations concluded for now. Update: 01-26-11 1120 hrs- Recovery Crews have found another car in the Delta Mendota south of Sperry Ave.
Update: 01-26-11 1000 hrs- The search for 4 year old Juliani Cardenas continues in the Delta Mendota Canal near Patterson Wednesday morning. Divers have located 10 vehicles in the canal after a week of searching on the west side of Patterson, but not the silver Toyota Corolla believed to have been driven by suspect Jose Rodriguez. "The fact that all of the leads right now point still to this canal, that this car possibly went into the canal," said Stanislaus County Sheriff's Department spokesman Deputy Raj Singh. Update: 01-25-11 0900 hrs- Dive Crews have pulled up 6th vehicle from Delta-Mendota canal, it is not connected to case. Update: 01-25-11 0900 hrs- Reports are in that another car has been found in the canal near Rogers Road. Divers are preparing to enter the water soon. Merced County search team is searching the Delta-Medota Canal about two miles south of the siphon at DP Creek, A second search team from the Stanislaus County Sheriff's Dept. is about 11 miles south at canal near Anderson Road in Crows Landing. Update: 01-24-11 0930hrs- Dogs were on scene at the canal yesterday, searching the water for a possible scent victim. Update: 01-22-11 1330hrs- Statewide Amber Alert for a missing boy has been reduced to a local alert and a canal search for him has been called off for now, according to the Stanislaus County Sheriff's Department. Update: 01-22-11 1130hrs- 5th vehicle found a Nissan truck., Sheriff reiterates that all evidence leads here, Sonar continuing to next downstream gate. 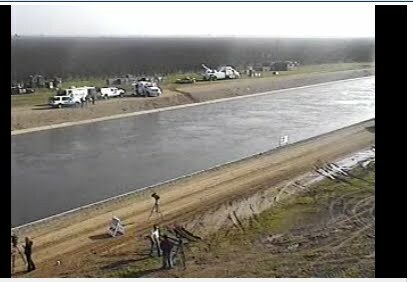 Update: 01-22-11 0830hrs- Stanislaus County authorities returning this morning to Delta Mendota State Water Project Canal continuing search for a missing 4-year-old kidnap victim and his abductor. Update: 01-21-11 1830hrs- Divers have recovered forth car in the canal near Patterson. it was not the Toyota Corolla being sought in the kidnapping of 4-year-old Juliani Cardenas of Patterson. Update: 01-21-11 1500hrs- Divers pulled a red Ford Mustang from the Delta-Mendota Canal this afternoon. It was the third vehicle dredged from the canal where authorities have focused their search for a missing 4-year-old Patterson boy and his kidnapper. Investigators believe the kidnapper's car may be in the canal. "This is getting frustrating. It's like riding a roller coaster," Stanislaus County Sheriff Adam Christianson said. "As always, we remain hopeful that we're going to be able to find Jiuliani and bring him home safely." Update: 01-21-11 1300hrs- Merced County dive team getting ready to re-enter Delta-Mendota Canal to examine an object to which ground crews had hooked a tow line. They weren't certain if the tow line was hooked onto a car that sonar had spotted this morning. Meanwhile, water project crews were preparing to halt for a short time the water flow into the canal so cut down the current and make it easier for recovery crews to get at the car. Update: 01-21-11 1100hrs Sheriff team using sonar to probe a canal near Patterson, searchers late this morning spotted a car near a siphoning system. Crews were trying to slow the flow of water to enable divers to access the vehicle, which authorities are trying to recover to see if it was used to take away a kidnapped 4-year-old Patterson boy. Authorities said it would take a couple of hours to lower the water level enough to enable the recovery of the vehicle, which was trapped near siphoning equipment in the Delta-Mendota Canal. Update: 01-20-11 1600hrs- Stanislaus County SAR Dive operation suspended, Sheriff has been unable to locate the car in canal. un-able to search near siphon 4,000cfs, 2 other stolen vehicles found. It is impossible to lower water level. Zero visibility precludes robot use. Update: 01-20-11 1130hrs- Stanislaus County, Delta Mendota Canal area of #AmberSearch Rains Rd. / Zacharias Rd. is approximately 2 blocks from kidnap site. Updated: 01-19-11- 1600hrs- Search Focus on Delta-Mendota Canal about 2 miles from scene of kidnapping. A dive team from the Stanislaus County Sheriff's Department is preparing to enter the Delta Mendota Canal after receiving information a car matching the description of one driven by the suspect in a Patterson abduction was seen going into the water Tuesday. After caller reports car going into canal the day before. Tire tracks found, and unrelated stolen Honda recovered. STANISLAUS COUNTY, CA - An Amber Alert issued for 4-year-old Juliani Cardenas, who was abducted from Patterson late Tuesday afternoon, has been expanded to a statewide search. The boy was taken forcibly from his grandmother by the child's mother's ex-boyfriend Jose Esteban Rodriguez on the 300 block of Barros Street in Patterson at 4:12 p.m., according to Chief Tori Hughes with the Stanislaus County Sheriff Department. ON JANUARY 18, 2011, AT 04:12 PM, JULIANI CARDENAS WAS ABDUCTED FROM PATTERSON/STANISLAUS/CA. JULIANI CARDENAS IS A 4 YEAR OLD, HISPANIC, MALE, 3 FEET 6 INCHES TALL, 40 POUND, JUVENILE WITH BLACK HAIR, AND BROWN EYES, LAST SEEN WEARING DARK PANTS, LIGHT BLUE SHIRT. SUSPECT IS JOSE ESTEBAN RODRIGUEZ, A 27 YEAR OLD, HISPANIC, MALE, 5 FEET 9 INCHES TALL, WEIGHING 180 POUNDS, WITH BLK HAIR, BROWN EYES, LAST SEEN WEARING A WHITE AND BLACK SHIRT, CHECKERED SHORTS, BEANIE. THE SUSPECT WAS LAST SEEN DRIVING A SILVER TOYOTA COROLLA, WITH A CA LICENSE PLATE OF 6HBW445. MAY BE EN-ROUTE FROM PATTERSON TO SAN JOSE. OTHER VEHICLE INFORMATION INCLUDES: OVERSIZE ALUMINUM WHEELS. LEFT REAR WHEEL IS THE SPARE WHEEL (SMALLER). VICTIM WAS ABDUCTED IN PATTERSON AND THE SUSPECT MAY BE ENROUTE TO SAN JOSE. IF SEEN CONTACT SERGEANT CAMARDA AT STANISLAUS COUNTY SHERIFF'S DEPT AT 209-552-3914.